The song of your heart. 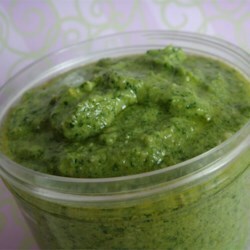 Cooking without tasting..and a fabulous recipe for pesto! For me, tasting and sampling go hand in hand with meal preparation..especially if it’s a new recipe, a sauce of any kind or frankly anything that requires seasoning. Not being able to taste, because my braces are in, is kind of like sculpting with a blindfold on. You find yourself relying mostly on experience and memory and common sense to guide you. It’s truly a strange process because you feel like you are making decisions without having access to the most important data you need; how the food actually tastes! Yesterday afternoon I tried a new pesto recipe for a cold pasta salad. I was using substitutions as I didn’t have all of the ingredients I needed, and my inability to taste what I was creating was especially bothersome. I kept adding a bit more of this and a dash more of that, but never was 100% sure about the choices I was making. In a strange way, making this pesto made me think of Hurricane Irma. What made the lead up to the storm so incredibly stressful was having to make decisions without access to all the information needed; most importantly where is the darn storm going? Stories abound of people fleeing from one side of the state to the other only to turn around and rush back again when the storm suddenly changed course. One family went from Miami to Tampa, from Tampa to the panhandle, and then from the panhandle all the way to Louisiana. One minute your evacuation plan was a genius move, six hours later it looked foolish. Playing your hand before all the cards have been dealt is simply a part of life. All kinds of big life decisions have to be made oftentimes before all the facts can be gathered. And just like cooking without tasting, or evacuating before a storm, the best we can do at those moments is to rely on experience, memories and use common sense as our guide. Blend the spinach, basil, pine nuts, Parmesan cheese, garlic, salt, pepper, lemon juice, lemon zest, and 2 tablespoons olive oil in a food processor until nearly smooth, scraping the sides of the bowl with a spatula as necessary. Drizzle the remaining olive oil into the mixture while processing until smooth.